Sat., July 1, 2017, 8:30 p.m.
EAST HARTFORD, Conn. – Dom Dwyer volleyed in a go-ahead goal in the 19th minute of his international debut, ran to the corner flag and did a double back flip that would make a gymnast proud. Brad Guzan saved Asamoah Gyan’s penalty kick in first-half stoppage time, and Kellyn Acosta added his first international goal in the 52nd minute on a low free kick that bounced in. Gyan curled a free kick just under the crossbar in the 60th, leaving the final 2-1 – matching Ghana’s victories that eliminated the U.S. from the 2006 and 2010 World Cups and the American win over the Black Stars at the 2014 tournament. “I got fired in 2006. It took me 11 years to get this job back,” Arena said, laughing, after the U.S. improved to 4-0-4 since he replaced Jurgen Klinsmann in November. Born in Cuckfield, England, Dwyer was in Norwich City’s youth system but broke his right foot three times and was released. He moved to the United States in 2009 to attend Tyler Junior College, shifted to the University of South Florida, then was drafted by Sporting Kansas City in 2012 and has played for the team ever since. He became a U.S. citizen on March 16 and made his international debut at age 26. Leroux, a 27-year-old forward from British Columbia, played for Canada at age 14 in the 2004 Under-19 Women’s World Cup, became a star at UCLA and switched affiliation to the U.S. She has 35 goals in 75 international appearances and helped the Americans win a gold medal at the 2012 Olympics and the title at the 2015 Women’s World Cup. They met when she was training with the national team in Kansas City and were introduced by a mutual friend. “We just kind of hung out. We were buddies, and then we started to hit it off,” he said. Of course, the home is filled with competition. They are only the fourth husband and wife to both play for the U.S., joining Jim Gabarra and Carin Jennings, Claudio Reyna and Danielle Egan and Zach Loyd and Casey Nogueira. Egan’s only goal was in 1993, four years before she married Reyna. Arena changed eight starters from his lineup in the June 11 World Cup qualifier at Mexico, retaining only Guzan, Acosta and Paul Arriola. Seven American starters entered with fewer than 10 international appearances. There also were debuts for a pair of midfielders: Kelyn Rowe started on the left flank and Kenny Saief, who played twice for Israel before switching his affiliation to the U.S. last month, entered in the 71st. Atop a 4-5-1 formation, Dwyer failed to take advantage of scoring chances in the 14th and 17th minutes, then broke through. Jorge Villafana dribbled from the left flank past defenders and laid the ball back to Joe Corona, who made his first U.S. appearance in two years. Corona’s shot hit Villafana and bounced up to Dwyer, who scored with his left foot from 8 yards. Dwyer broke in again in the 24th and was sent tumbling by a studs-up tackle from goalkeeper Richard Ofori, who was given only a yellow card by referee Ismael Ornejo of El Salvador. “First 10 minutes or so, he looked a little nervous out there, but he got ahold of the game and did well,” Arena said. Getting ready to open the Gold Cup against Panama on July 8, the U.S. wore new uniforms with red and blue horizontal stripes. Leroux, at home for FC Kansas City’s National Women’s Soccer League match on Sunday, watched with 10-month-old son Cassius and teammate Becky Sauerbrunn. 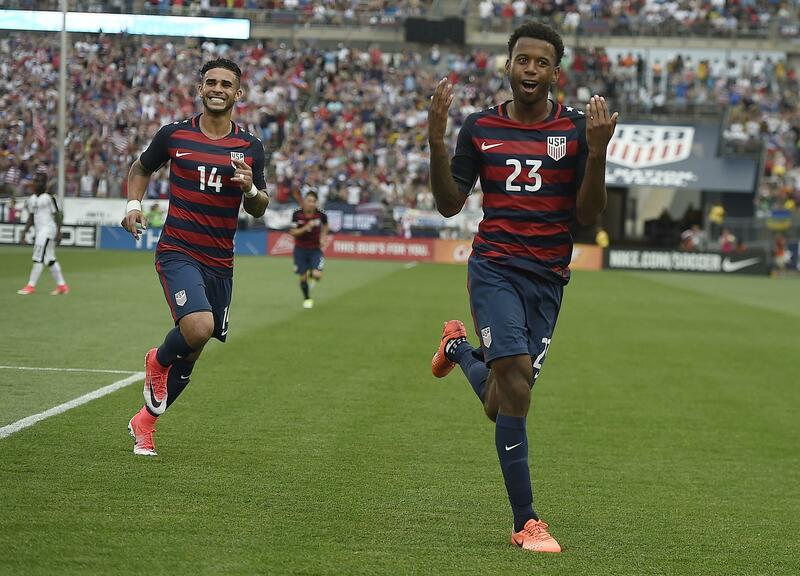 Cassius wore a white home U.S. kit with mom’s number, according to a photo she posted on Instagram. Will he wind up playing for the U.S.? Arena, 65, won’t be waiting. “You don’t expect me to be coaching, do you?” he said. Published: July 1, 2017, 8:30 p.m.